When entering a writing competition it’s nice to think that your entry fee has gone to a worthy cause – it softens the blow of not making it to the short-list! 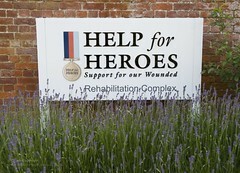 The Help For Heroes charity is running a poetry competition. First prize is £250 in Primark vouchers and there is no fixed entry fee but entrants are asked to donate at least a pound per poem and all money raised will go to the charity. The winner will also have their poem published in a general collection of modern poetry and will receive a free copy of the book as well as attending a prize presentation. The closing date is November 11th 2011 and full details on how to enter can be found here. This is a cheap to enter competition for a worthy cause – why not give it a go? This entry was posted on July 14, 2011, 11:00 am and is filed under Competitions, Poetry. You can follow any responses to this entry through RSS 2.0. You can leave a response, or trackback from your own site. This looks good. I have a poem in one of United Press’s Anthologys. My small world where we were asked to write about our home town. Will have a go at this one, thanks for pointing it out. What a wonderful idea. I’m going to have a go, or two. Susan and Baggy – Best of Luck to both of you! Glad you found it useful, Shirley – and let us know if you win! I’m hopeless at poetry too, Ceka, but think I might try and put something together for this – if nothing else, it’ll be a good writing excercise! My daughter has written a beautiful poem about the soldiers and is called the hero. We would love to enter into the competition and if possible send a postal order instead of a cheque. Hannah – I’m not involved in the competition, I have merely publicised it. You will need to contact the organisers direct with any questions. Good Luck to your daughter!